Metahaiweeite: Mineral information, data and localities. The name indicates a dehydrated state (meta) of haiweeite. 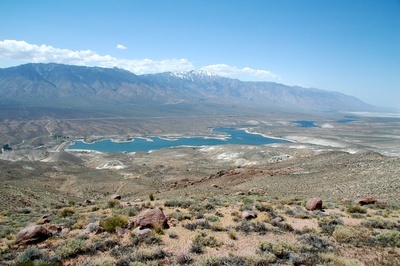 The root name is for the Haiwee Reservoir, California, located near the type locality. This page provides mineralogical data about Metahaiweeite. McBurney, T.C. and Murdoch, J. (1959) Haiweeite, a new uranium mineral from California. American Mineralogist: 44: 839-843. 53.3.2.1 Weeksite K2(UO2)2(Si5O13) · 4H2O Orth. Fleischer, M. (1960) New mineral names. American Mineralogist: 45: 753-756. Bezing, L. von, Bode, R. & Jahn, S. (2007): Namibia. Minerals and Localities. Edition Schloss Freudenstein, Bode Verlag, Haltern, 343 pp. (in English); Irene M. Abraham (2009): Geology and spatial distribution of uranium mineralisation in the SK anomaly area, Rossing area, Namibia, Master thesis University of the Witwatersrand. American Mineralogist (1970): 55: 185.